[Review] Ordering from Patty’s was the easiest process from our wedding! Wow! These cupcakes are absolutely delicious. My husband and I decided to do a cupcake tower for our wedding. Phillip met with us and let us try a handful of different cupcakes. The hardest part was picking the flavor! On our wedding day, Patty’s team set up the cupcake tower for us. Guests loved choosing different flavors and how light the cakes were. Can’t wait to stop by again and pick up some treats! [Review] The most delicious cakes I’ve ever had! Patty’s cakes have the most delicious cakes I have ever tried. I highly recommend this cake place. Thank you very much, Patty’s cakes. [Review] Lots of yummy fun at our cake tasting! 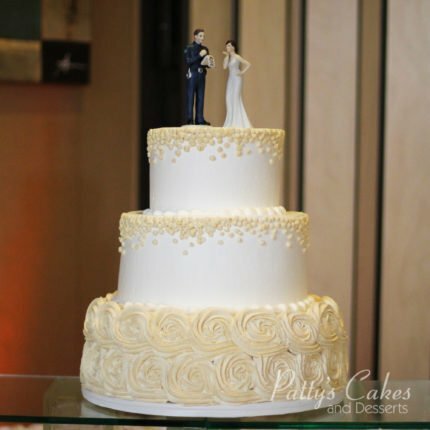 Our wedding cake was delicious!!! We had lots of yummy fun at the tasting. My husband got so into the appointment, he actually designed the entire cake… flavors and all. Even though there was more than enough cake for everyone, there wasn’t a single piece left. Our guests really enjoyed it. The best part is that we didn’t need to save the top tier. One, it takes up space in the freezer and we never intended to save it. But also, Patty’s Cakes will bake us a complimentary anniversary cake. They will bake a 6″ round double layer cake in honor of our anniversary and the cake does not need to match our original order. Can’t wait… which is why we don’t! We visit often for the cupcakes and ice cream! We ordered a cake for our July 4, 2017 wedding. This was the best wedding cake we ever had, the flavor was spectacular. It was also a beautiful cake, we wanted the flavor to be a top priority and Patty’s Cakes did not disappoint. I love Patty and her staff they are kind and friendly. It was worth the 2-hour drive to get such a great cake and fantastic customer service. Patty takes pride in her work and it shows. 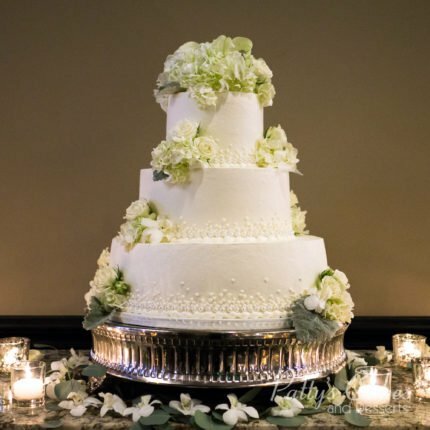 Don’t hesitate to get your wedding cake here or just stop in for a cupcake. Amazing cupcakes! The best cakes! And the cake balls are a mouthful of happiness! I’ve never been able to truly enjoy a cupcake without having to wipe half the thick sugary icing off… but that’s not the case with Patty’s. The frosting is light and fluffy/creamy. It’s the perfect amount of icing and I can enjoy every bite without that sick “I ate too much sugar” feeling. And the flavors are all so good. I’m a big fan and will remain a fan for a very long time. I love their new “ready to go” cakes. I’ve taken advantage of those a few times for friends and family birthday parties and baby showers. And the cake is ALWAYS the talk of the party. Everyone loves it! I LOVE Patty’s Cakes and they will have my business for many years! [Review] The best cupcakes, cakes, and sweets around! Some of the best cupcakes, cakes, and sweets around. I was a hard Hapa Cupcake fan but when I tried Patty’s cupcakes I was sold. The bread was soft and moist and the frosting took it over the top. I definitely recommend this spot if you have a sweet tooth. Came in for a wedding cake tasting on a Saturday morning. You show up on a first-come-first-serve basis which some people might not like but worked out perfectly for us since both our schedules vary so much. There were about 4 other couples at the same time so everyone had to patiently wait their turn for each part of the process: fill out information, pick three flavors with two fillings each, look through design book and bookmark the ones you like, taste, rate, book. Even though the rep was working with so many of us the quality of service was excellent. Super friendly and accommodating. The cakes were amazing, all of them so moist and flavorful, never overly sweet. We were amazed at how delicious they tasted and how affordable the cakes are compared to other places we have been to. 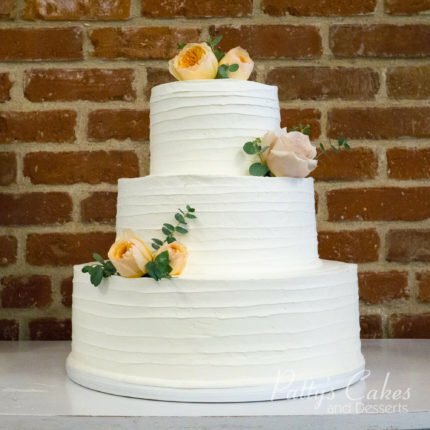 We booked a three-tier wedding cake with one sheet cake, banana with cream cheese filling and vanilla custard (we got to pick both fillings for the same price). I would recommend to everyone! Can’t wait to have it at our wedding and have that wedding cake topper all to ourselves! Yum! I ordered my daughter’s graduation cake from Patty’s Cakes and it was super delicious and moist! I was very happy with the service as well. Michelle helped me out, and she was very nice and helpful. I showed her a picture of the cake I wanted and I loved the way it turned out, it was simple yet beautiful. Try the banana flavor it’s yummy!